Social media can level the playing field between industry leaders and upstarts, between multinational corporation executives and small-business owners, making peers of all participants. Yet appearances can be deceiving. To borrow from George Orwell's Animal Farm, all social-media users are equal, but some are more equal than others. If you want to make your mark on social media, first and foremost you should provide quality content. "Content is twofold," says Mari Smith, a social-media marketing expert and author of The New Relationship Marketing: How to Build a Large, Loyal, Profitable Network Using the Social Web (Wiley, 2011). "It's generating your own, [being] a thought leader. The other element is what I call OPC -- other people's content -- and not being afraid to share that." One man who successfully balances both elements is entrepreneur, investor and author Guy Kawasaki. "He's a self-professed 'firehose of content,' " says Smith. "He has a way of creating a nice blend of other people's content as well as his own thoughts and opinions." Not only that, but according to his Twitter bio, Kawasaki repeats every tweet four times in order to reach all time zones. Quantity is not the same as quality, of course, but what is remarkable about Kawasaki, says Smith, is "his masterful ability to curate such volume. I could skim through his tweets and probably find a few things every day that I could pass on to my followers." On social media, it's important to be available to your audience, and few people exemplify that principle better, says Smith, than entrepreneur Gary Vaynerchuk. "On Twitter, he does a lot of responding" to followers, she says. "He treats everybody as an equal, and he responds at an amazing velocity." What's the upside of all this time-consuming engagement for Vaynerchuk? A loyal and devoted following for his business books and priceless visibility for his consulting business, VaynerMedia. "People love it," Smith says. "If they get a response from Gary, even if it's a smiley face, they're like, "Oh my God, Gary tweeted back at me!'" On social media, you can either be a generalist -- producing and curating a hodge-podge of content across many different disciplines -- or you can choose to specialize in one or a few areas. Specialists tend to bend more ears than generalists, says Smith. "Social media is extremely noisy. You've got to be able to stand out," she says, and the best way to do this is to own a particular subject. Jessica Northey, founder of Tucson, Ariz.-based social-media marketing boutique Finger Candy Media, "owns" country music, says Smith. Northey hosts a live weekly Twitter chat and Google+ "twangout" for country-music fans. This year, Forbes ranked Northey at No. 3 on its list of the Top 50 Social Media Power Influencers. She has more than half a million followers on Twitter and more than 700,000 on Google+. "In my travels, if I came across anyone in the country-music arena, Jessica would be my choice" of someone to connect them with, Smith says. For an entrepreneur, time spent on social media might seem like a distraction from the more important tasks central to running a business. Because it's so time-intensive, you should back up your thought leadership on social media with a real profit-making enterprise. Chris Brogan, founder and chief executive of Human Business Works, a business-training company in Portland, Maine, is one example, says Smith. "He walks his talk. He speaks all over the world, and he consults with a lot of companies on social media." In other words, Brogan demonstrates his expertise in blog posts, uses social platforms to broadcast those posts and then uses the resulting visibility to market himself for speaking gigs, coaching sessions and more. These, in turn, increase his social media following. And it doesn't hurt that he was able to carve out a place for himself by being an early adopter of social platforms, Smith says. 5. Embrace each social network's unique culture. Each social network has a "unique culture," says Smith, and the best users embrace it rather than sharing identical content across platforms. Take Cory Booker, the mayor of Newark, N.J. He relies mainly on Twitter, where he has more than 1.2 million followers, and Facebook, and uses each platform in a way that takes advantage of its native capabilities. "On Twitter, I see him retweeting people, I see him thanking people and engaging with them," Smith says. She also notes that Booker makes use of hashtags, a popular way of marking your tweets for a specific purpose or larger conversation. On Facebook, by contrast, Booker posts less frequently. "You don't want to bombard people on Facebook," says Smith. He finds more elaborate ways to involve his community in his activities. For instance, he uploads albums of photos from various events where he has spoken. Some power users maintain a presence on multiple networks, Smith says, but for most people two are enough. "Really you want to have Facebook and one other [platform] that you're active on," she says. 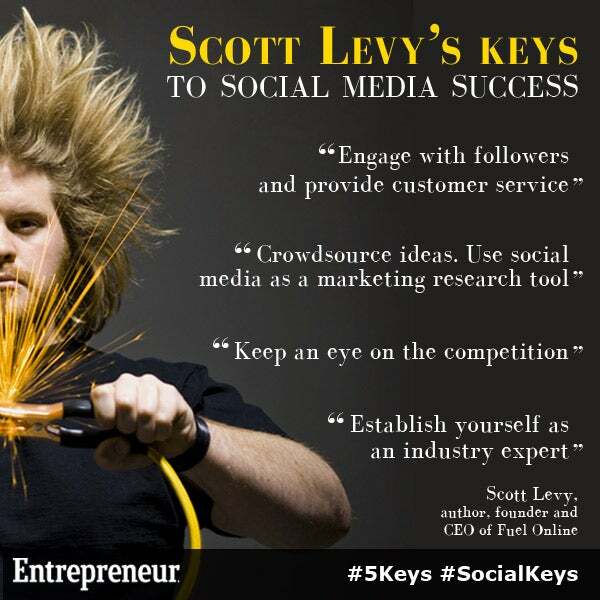 What are your keys to social media success? Share your thoughts in the comments below. The best submissions will be featured with your name. Jun 25, 2013, EmbarkCreative Define your audience/customers, figure out where they are, and be there (i.e. Twitter, Facebook, Pinterest, et al). Being everywhere can be a wasted effort. • Ensure your social media strategy is in line with the goals of your business. Don't get off track. • Integrate your social strategy with all other marketing/outreach efforts...ensuring a cohesive brand. Jun 28, 2013, Dani Norgren Automatically posting the same content to every social profile doesn't work. Every social network has a different niche you need to tailor your content to.